Green Acorn is a Guernsey based company established to meet the growing need for energy optimisation and storage solutions. They offer a choice of emergency back up, efficient energy storage and renewable generation optimisation including off grid solutions for commercial, agricultural, community and domestic installations for local, national and international clients. 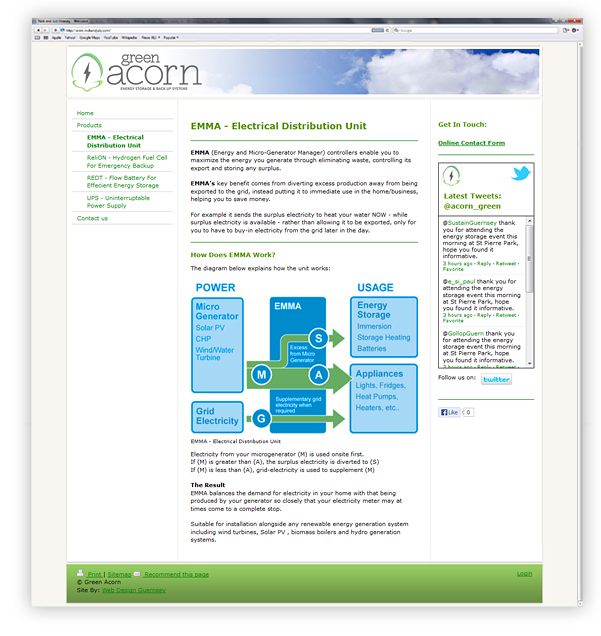 Click here to view Green Acorn Website. 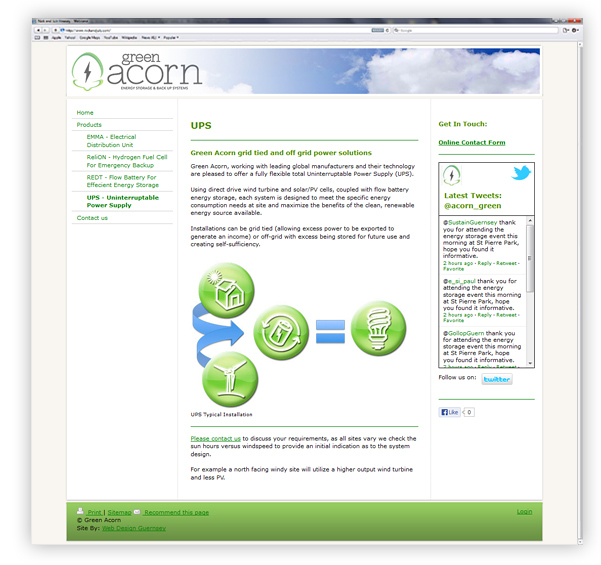 As a new company it was very important that the Green Acorn website presented a modern, efficient image which reflected the company. Working with Matt made this straight forward to achieve as he understood quickly what we wanted from the site and designed it so that we could easily update the content without needing technical knowledge or specialist skills. Additionally this was all done within the tight time and budget constraints we had. I look forward to working with Web Design Guernsey as our company develops and grows to incorporate new features and functionality. Client Feedback: Keith Hounsell, Green Acorn. Guernsey. The design of the website needed to be clear, simple and professional. The aim of the site is to give visitors a clear insight into the products they sell and to ultimately have them contact Green Acorn via the online form. 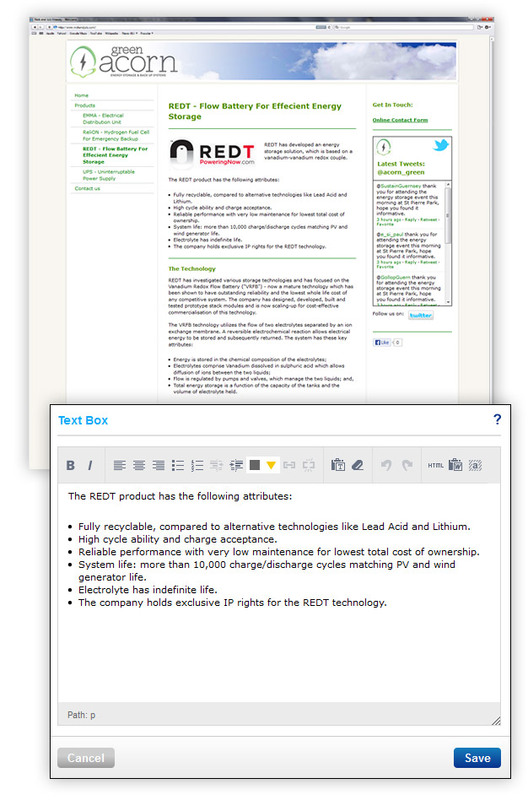 Detailed product descriptions are included on the relevant pages along with diagrams and photographs where appropriate. Graphics were produced in complimentary colours to the company’s logo and branding. The latest social media updates are displayed in real time in the sidebar of the website via a Twitter feed which shows their latest Tweets. Green Acorn need to be able to update their website themselves on the move whenever a new product is launched, they host an event or simply want to inform their visitors of relevant news in their industry. With a Content Management System (CMS) they are able to do this online via a simple log in. Once logged in they are able to update content, add new pages and manage their website with no web development or html editing skills. Such ‘drag and drop’ simplicity means that their website can be updated in seconds and ensures it’s always up to date. The benefits of having a regularly updated website are two-fold. Firstly it means that their visitors can be sure that they are reading current information, and secondly, from a search engine optimisation (SEO) perspective, their site will regularly be spidered by Google and Bing giving them great natural rankings in search engines.